This new image of Centaurus A combines ALMA and near-infrared observations of the massive elliptical radio galaxy. 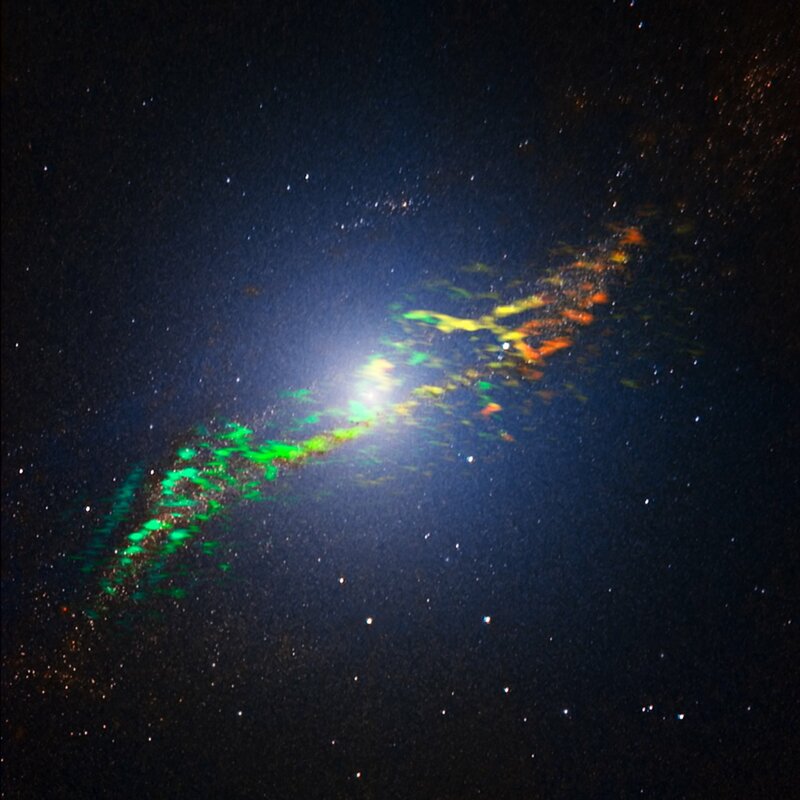 The new ALMA observations, shown in a range of green, yellow and orange colours, reveal the position and motion of the clouds of gas in the galaxy. They are the sharpest and most sensitive such observations ever made. ALMA was tuned to detect signals with a wavelength around 1.3 millimetres, emitted by molecules of carbon monoxide gas. 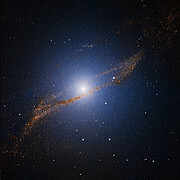 The motion of the gas in the galaxy causes slight changes to this wavelength, due to the Doppler effect. The motion is shown in this image as changes in colour. Greener features trace gas coming towards us while more orange features depict gas moving away. We can see that the gas to the left of the centre is moving towards us, while the gas to the right of the centre is moving away from us, indicating that the gas is orbiting around the galaxy. 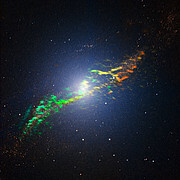 The ALMA observations are overlaid on a near-infrared image of Centaurus A obtained with the SOFI instrument attached to the ESO New Technology Telescope (NTT).